Can we trust the Bible completely? Is it sufficient for our complicated lives? Can we really know what it teaches? 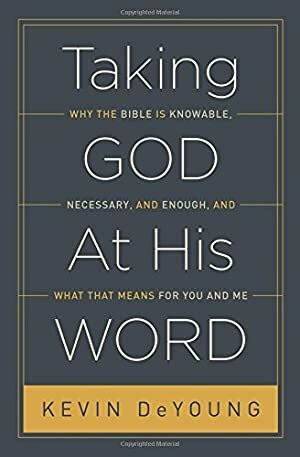 Avoiding technical jargon, this winsome volume will encourage you to read and believe the Bible -- confident that it truly is God's word. Track It. This book has been $2.99 within the past year. Log In to track Kevin DeYoung on eReaderIQ. to be notified each time the price drops on any book by Kevin DeYoung. to stop tracking Kevin DeYoung. We started tracking this book on March 4, 2014. The price of this book has changed 103 times in the past 1,876 days. This lowest price this book has been offered at in the past year is $2.99. The lowest price to date was $0.99 last reached on September 30, 2014. The highest price to date was $13.28 last reached on September 14, 2015. This book has been $13.28 one time since we started tracking it.